KÄINA, ESTONIA–The combined Wooster and Ohio State geology team left Saaremaa Island this morning and traveled to Hiiumaa Island to the north in our search for more Silurian outcrops and their associated fossils. 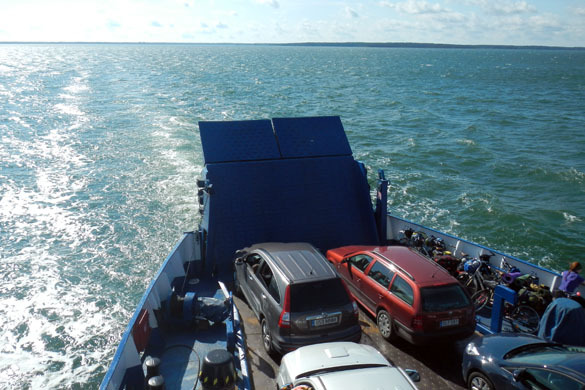 We drove from Kuressaare to Triigi on the northern coast to catch a 9:30 a.m. ferry to Sõru on the southern coast of Hiiumaa. It was my second visit to this island. Like every other place in Europe, it has a long history. Settlement on Hiiumaa goes back to the Fourth Century BCE. For generations the island was known by its German name: Dagö. In recent times it has been Swedish, Russian, German, Estonian, Russian again, German again, and finally part of modern Estonia. 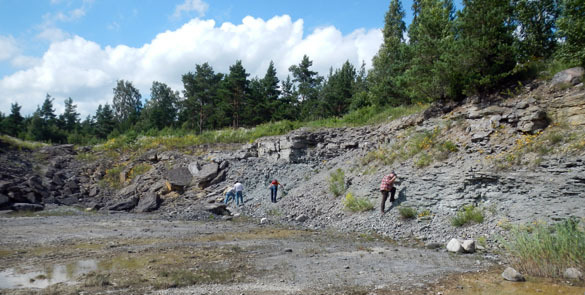 The main attraction for the Wooster Geologists on this trip is Hilliste Quarry (seen above) in the southeastern portion of Hiiumaa. 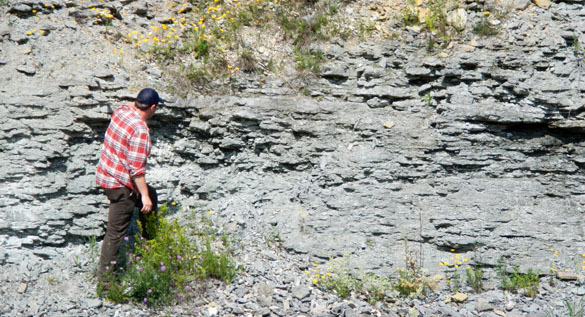 The Lower Silurian (Rhuddanian) Hilliste Formation is exposed here — one of the few in this time interval worldwide. Jonah Novek will be starting his Independent Study project here, building on the labors of Rachel Matt last year. We are all continued to search for crinoids here as part of our joint work. Jonah is seen here in his first few minutes of examining the Hilliste Formation in our little quarry. The rocks remind me of the Cincinnatian Series because they are a sequence of bioclastic and biomicritic limestones separated by thin beds of shale. This means fossils can be exquisitely preserved on the top and bottom surfaces of the limestones where they meet the soft shales. An example are these trace fossils preserved on the underside (“sole”) of a biosparite limestone bed. These traces are in “convex hyporelief”, meaning that they stick out on the bottom of the bed. They were formed by deposit-feeding worms of some sort. We’ll have much more on the rocks and fossils of the Hilliste Formation in later posts. After briefly visiting Hilliste Quarry (mainly a test to see if I really remembered how to get to it), we then traveled to the southeast coast of the island (the Sarve Peninsula) in the hope that we could find some exposures of Silurian limestones. There were tantalizing hints in the limestone shingle along the eastern shore and limestone slabs at the bottom of some roads, but there were many swamps and marshes. 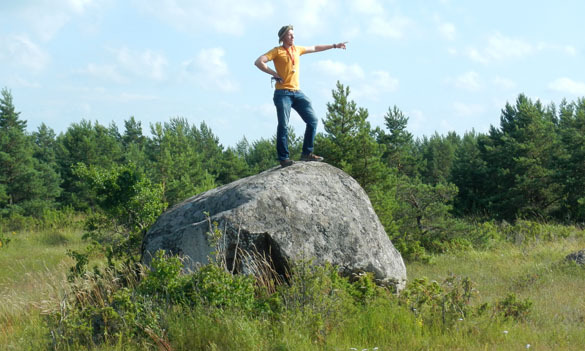 Sometimes we had to use the giant glacial erratics to see above the trees, as Jeff Thompson is heroically demonstrating here. We never did find additional exposures of bedrock. In the search, though, we saw many gorgeous vistas, like this one of a coastal marsh. (Note the excellent weather, by the way.) We will have several days to continue our quest for limestone on Hiiumaa. Whenever you wander any distance in Estonia, you find reminders of its bloody and tragic 20th Century history. Rather than repeat the war stories, I’d like to end today with a happier image of a World War II pillbox enlivened by the joyful faces of Jonah and Richa! I love that OSU crew that you have and I am not at all shocked about the picture of Jeff Thompson on top of the rock.